Nike has long been the star of the apparel industry. While Macy’s, Abercrombie & Fitch, and Gap have reported declining sales, Nike’s growth has been explosive. But a recent story in The Wall Street Journal points out that the company may be facing some speed bumps. Here are some of the core issues that the company is up against. Nike has long been viewed as immune to the struggles of the apparel industry, but the sector s still ailing and consumers for the most part don’t want to spend money on apparel. A recently Morgan Stanley report predicts that apparel and footwear sales will grow 1-3% over the next three months, but the report showed that year-over-year growth on a 3-month average for clothing and accessory stores were down -5%. The sporting goods, hobby, book, and music store category was up 4.9%. 2. 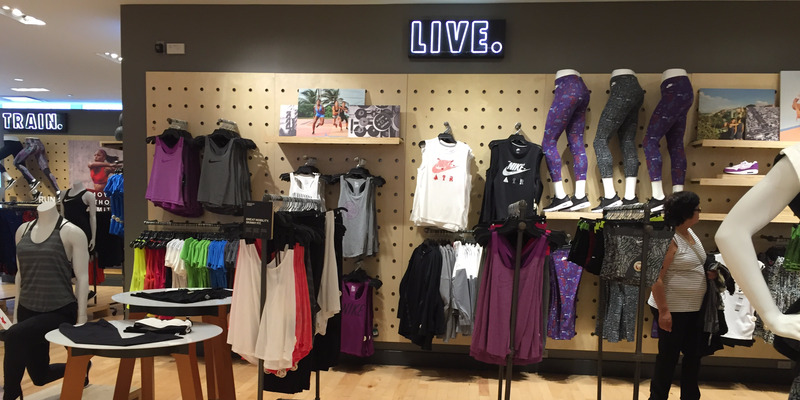 Women’s athleisure is getting more crowded by the day. There are the major competitors — like Lululemon and Under Armour — and then there are more niche brands, like the ultra-luxe Sweaty Betty and Bandier, and Outdoor Voices, pictured above, which prides itself on branding that focuses on fun, rather than being competitive and the best. In other words, its the anti-Nike, and that could be appealing to girls who sought an alternative to Nike’s “just do it” mentality. Though in sheer size none of these brands — even the rapidly growing Under Amour — have nothing on Nike, The Journal points to an NPD study that says there are over 700 athleisure options for women to wear these days. Put all of these smaller brands together, and you could have an actually viable threat to Nike’s market share. 3. The most popular product might be going out of style. But stylish sneakers are now in, and that has helped Skechers emerge as a major player in the athletic footwear category. Nike announces earnings for fiscal 2016 on Tuesday.